The tradition of the king cake is that it is shaped as a crown (to represent the crowns on the wise men who visited the baby, Jesus). A small plastic baby is inside one of the pieces of cake. If you get the piece with the baby, you are supposed to bring a king cake to the next gathering. 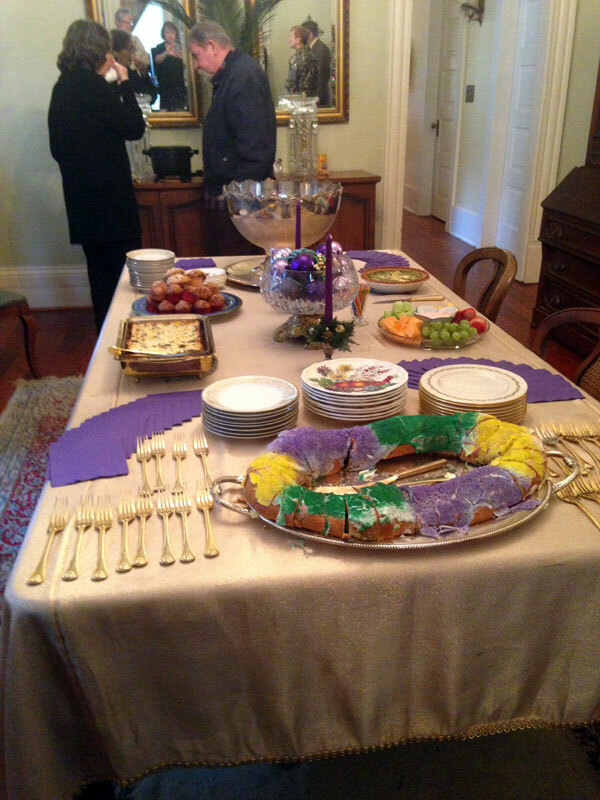 You can see there is plenty of purple, green and gold which are the official Mardi Gras colors. Rex (the King of Carnival) selected the official Mardi Gras colors in 1872, honoring the visiting Russian Grand Duke Alexis Alexis Alexandrovich Romanoff, who suggested the colors. The 1892 Rex Parade theme “Symbolism of Colors” suggested the colors’ meaning. There is so much history and tradition surrounding Mardi Gras and the Carnival season that includes festive parades and sparkling Mardi Gras balls. What a wonderful time to live in New Orleans! Brown sausage and drain. Spray a 13 x 9 pan with non-stick spray (don’t forget this step – trust me) . Mix together the melted butter and hash browns and press into the bottom of the pan. In another bowl, mix together the sausage, eggs, onion, cheddar, cottage cheese and sour cream. Pour mixture over the hash browns. Bake for an hour at 375 degrees for 45 – 55 minutes. Oh, this looks so good! I am saving your recipe because I am always on the hunt for good brunch recipes. We just got home from a vacation out west, and passing through Louisiana, I saw billboards advertising bakeries which advised us to go ahead and order our king cakes! You should see the sad things in the grocery stores here they call king cakes — atrocious. I love the punch bowl! Everything looks delicious! My daughter was just telling me yesterday that we need to get a king cake! Thanks Lois – Wish you could be here! Table beautiful; food looks wonderful!